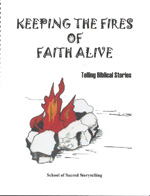 Keeping the Fires of Faith Alive, Telling Biblical Stories, compiled by Pam Maben and Cover by Teralene Foxx. Contributions of members of the School of Sacred Storytelling. 2003. Sharing of stories that were told in seminars lead by Robert Bela Wilhelm of the School of Sacred Storytelling. Through the book we have tried to capture some of the stories of the various participants by putting them down in written form.